They had never failed to show their devotion and their raunchy expression,whenever I return home from a trip. My wife and I left home for 2 long week to man our booth at the recent Canton fair2012 in Guangzhou China. This is the longest period both of us have ever been away from home. Our son did a good job taking care of them during our absent. When we returned 2 days ago, there was a big commotion when our son opens the gate apron our return. 2 thunderbolt of muscles came bolting down the driveway. Each swarming over the other trying to be the 1st to pawl and lick us. With 2 x 30kgs of muscles, we have to stop and drop our luggage to prevent being topple over. Their over drive enthusiasm to greet us melts our heart. It took more than five minutes of body rubs and hugging before they calm down and allow us to reach house. This commotion brought our neighbor out and they had a good laugh. For the whole evening both of them leech around us, as if they are worried we might leave home again. With the long flight back we retired early, as usual they were in our bedroom taking up their sleeping space the moment we stepped into our bedroom. Our son informed us that Santa and Teddy had been sleeping along the door way the whole period when we were not around. My wife facial expression indicates that she is not too happy with the news. Dogs do have your special way to make their owner love and treasure them. The nature of my business requires me to leave the house every month. Whenever I pack my bag the night before my departure, she sense that I will be leaving the house soon. When I pack my bag, she will moves very closely around me and rub her body hard against my legs as I packed.Normally I packed my bag in my study room, as usual, after packing, I will be on my computer during this period she will be laying around very close to my legs,at time even laying on top of my feet. When I retired into my bed room, as usual, she will be sleeping in our room. MY other dog,Santa a 2 year old male chow chow has yet to developed this understanding that packing bags means I will be leaving the house. They have never failed to show their love and happiness when I return from my sales trip. The moment I open the door apron my return, 2 cannon ball of muscles will be jumping up and down, kissing and lapping all over my legs and hands or what every parts of my body that they can lay their mouth on. Their tails will be whirling like a propeller gone crazy. They will only calm down after I had given each a fair share of body and head rubs. It will take at least 3-4 minutes before I have a chance to remove my shoes and move pass the door way. They will follow me in to the study and both of them will rush to smell each any very part of my luggage, trying to detect all the scents. Dogs apparent “see” through their nose. My wife normally pick me up at the airport, and she will always fore warn me that our 2 crazy dogs will be waiting at the door for our return. This special home coming greeting is most heart warming. This raunchy form of greeting is extended to every member of our family should they leave the house for a period of time. They will be all over my son when he returns from the U during the weekend. Every night when I work in my study, Terry the older female chow, will follow my wife to the bedroom when she relax and watch TV in the room. Santa the the younger male will be sleeping just outside my study the lights and noise from the computer do disturb his sleep. When it is time to retire to my bed room, Santa will be in my bedroom before I even have a chance to jump onto my bed. I am wondering how he knows that I had I am no longer in my computer room. He is snoring away every night by the time I call it a day, any yet he is able to detect my movement even in this sleep. This amazing canine ability is way above us. Having a dog in the house is good replacement when our kids had grown up and living in their own hemisphere. I am glad that our 2 loving chow chow is in a way keeping my wife company when I am away. In fact my wife treats our dogs like a kid. During the initial stage when I see my wife talks to our dogs as if they were kids with the ability to understand what is is talking, make me uncomfortable, and I was afraid that my constant travels had an effect on her. I had asked her why she talks to the dogs like the way she speak to a kid, her explanation was , she like to keep the dog happy and feel wanted. I am now happy and feel secure that her action is more of her natural maternal instinct than anything else. In short a dog is a 4 legged security alarm, a companion that does not talk back and most important an emotional therapist. To be loved and be wanted and the chance to display our loves plays an an important in ensuring that our daily life is rewarding and stress free with a good feeling emotion. 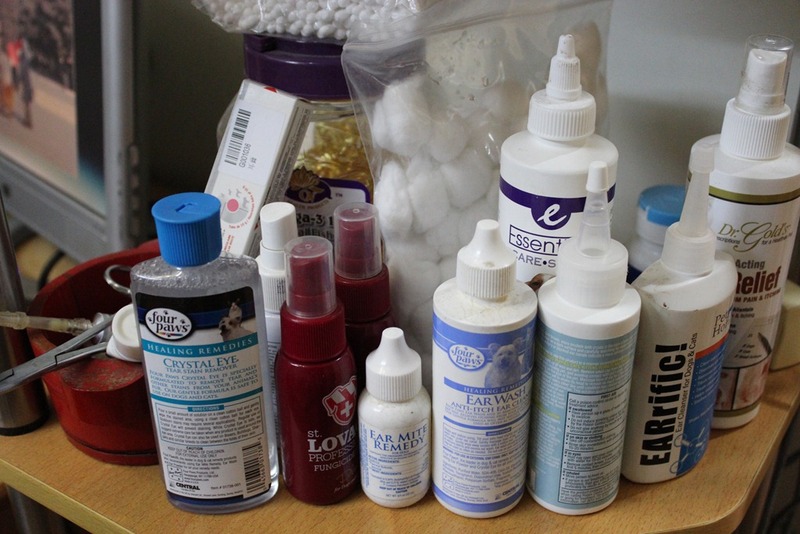 Our over the counter medication for our dogs is a war chest consisting of medications to clean ears and to remove and control ear mite.Itch and pain relief spray and other fungicide spray. Tools and forceps and bags of cotton balls. Our dogs have a free ranch life style, not confined to cage means and they moved freely around bushes and grass land. This keep our dogs free of pent-up energy and fully socialised having no fear of humans. They play and keep to themself without fear inhibition which means they will not bite or attack passer by. They have a free and easy life style moving between outdoor and indoor as and when they want. The negative side of this life style means we have to constantly examine their bodies . Playing around bushes and glass land means there will be occasional cuts and dirt on their body. Twice weekly close examination and medication keeps them in good health. 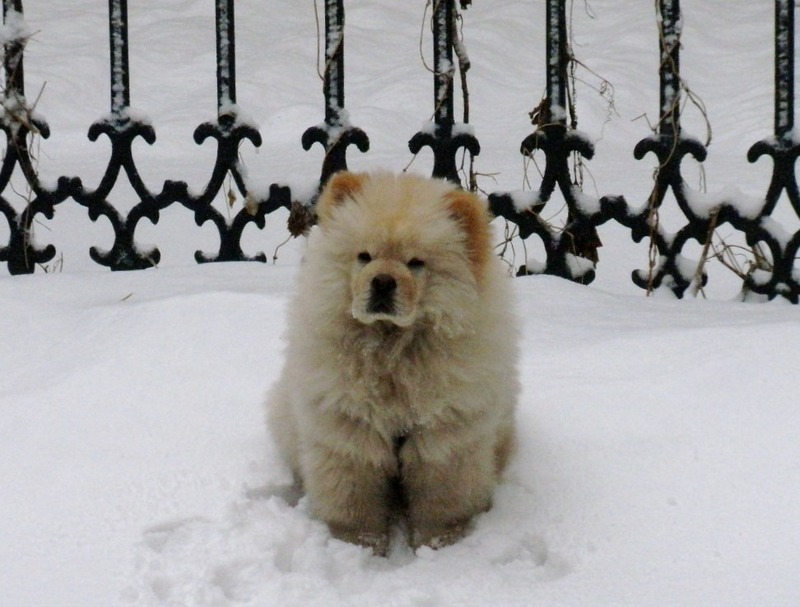 Chow chow from a cute puppy to polar bear lookalike. 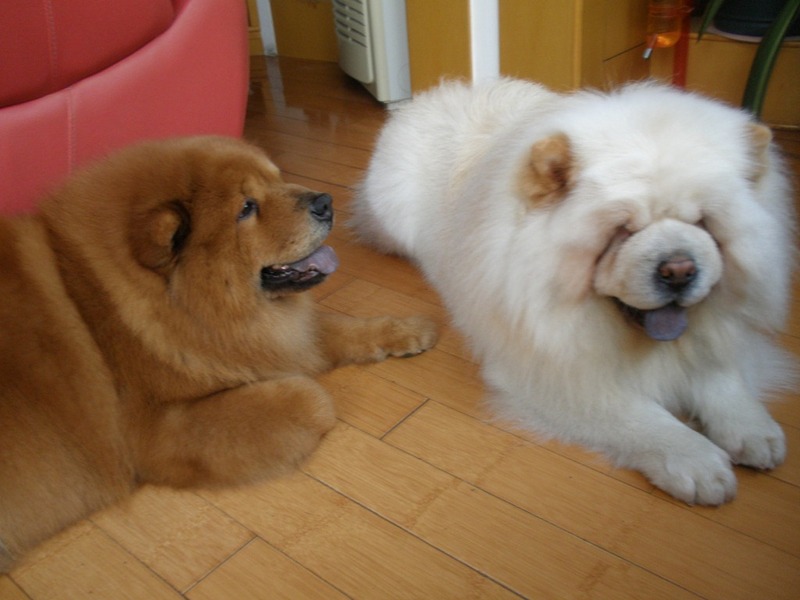 We have take pictures of our 2 chow chows from the day they are a puppy, keeping records of their facial changes. 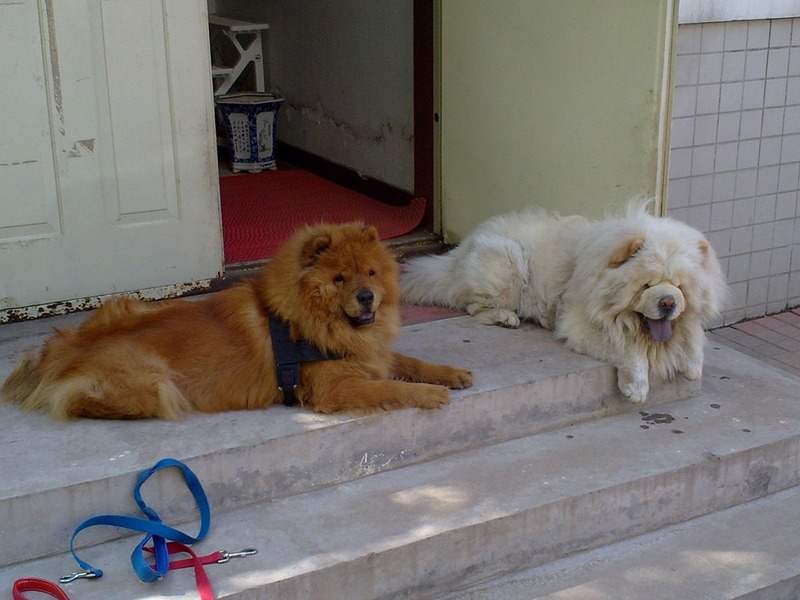 As of this month our female brown chow chow Teddy is 4years old and Santa is 2years old. this slide show reflects the change in their appearance, Teddy now looks like a lion and Santa takes on a polar bear lookalike. Teddy and Santa from a puppy to a full grown adult. 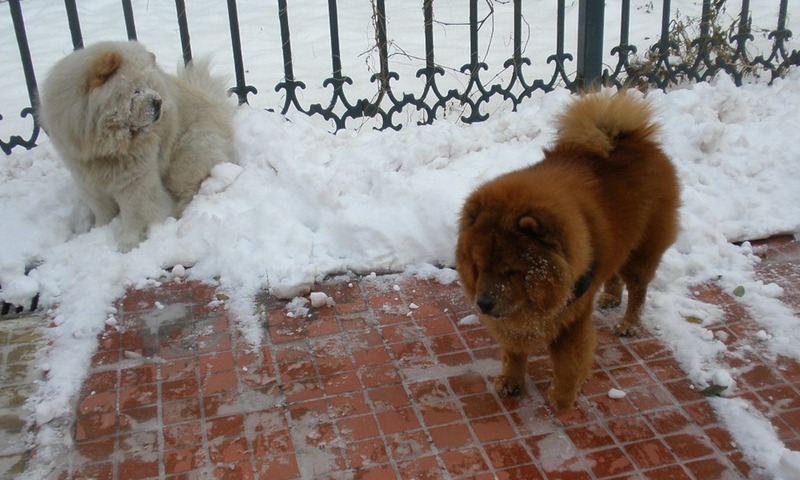 Our chow chows love the cold winter season. 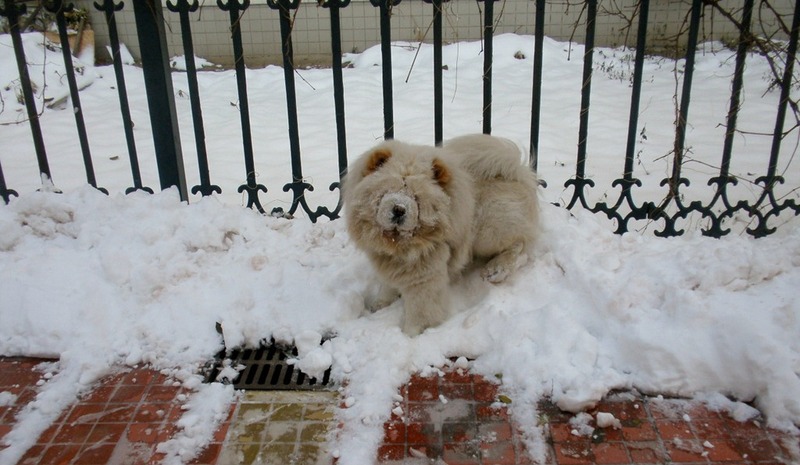 They love playing in the snow and can spend hours out door even when temperature is –20deg C.
My only fear is their pawls getting frost bite. They dislike wearing doggie boots. Santa’s favourite action is to immersed this head into piles of snow. Yesterday was this year 1st snow fall and it continued for morning the next day lasting more than 12 hrs. 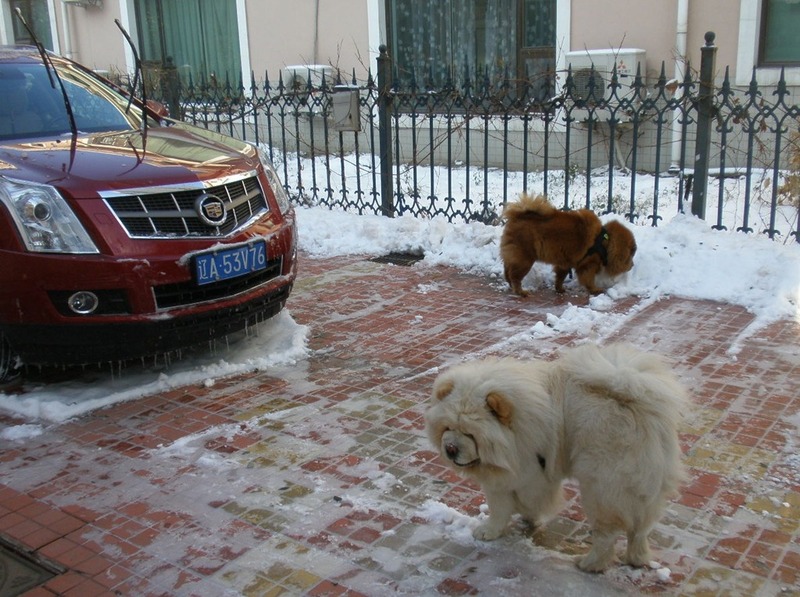 Clearing the drive way is a tough job but full of fun specially with our 2 crazy dogs trying to stop the the snow board. The moment I had pushed the snow into a pile they will jump on top of it. Normally when I command “ Go home” they will walk back into the house. However when there is snow around, commanding them into the house takes some shouting before they obey. I can see their displeasure when they walk slow back towards the door with their heads down and constantly turning their heads back to look at me as if to say—“ I want to play, can I stay” . Once I see their sad expression, I have to reverse by command. The word “come” will see 2 rushing bodies galloping into the snow pile. For the past 2 years I have not been able to create a snowman, The moment I built the body , Santa will jump on to the snow pile. I had given up making a snow man thereafter. Our 2 chow chows obey all my command without fail. However it seems their brains shut down when they see cats, squirrels and all feather fowls, they will chase after them and will not obey any command to stop. This hardwired part of their instinct makes me realised that chow chow being a hunting breed cannot be tamed. They might be very obedience and docile, but once they encounter small animals their hunting instinct takes over. However this attack instinct does not apply to small dogs or puppy. Our dogs are very friendly to small dogs and puppies. It looks like smell plays a part in their brain to differentiate between same breed and prey.